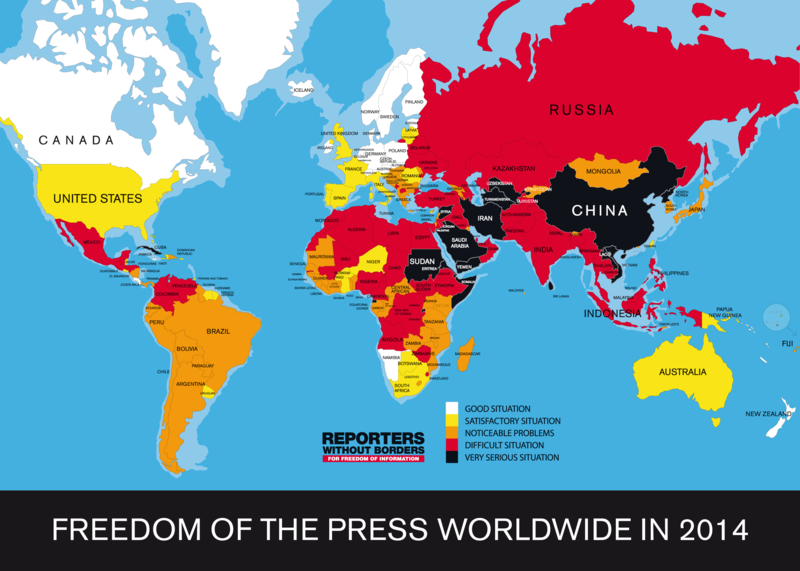 The international media watchdog released its annual World Press Freedom Index (WPFI) on February 12th, naming Finland, the Netherlands and Norway as the global leaders on media freedom for another year in a row. Last year's worst performers – Turkmenistan, North Korea and Eritrea – also retained their positions at the bottom of the index. The Paris-based body described the three states as "news and information black holes and living hells for the journalists who inhabit them". RWB compiled the index using a set of indicators, including the level of abuse, the extent of pluralism, media independence, the quality of the legislation governing the media, transparency of media regulators, the performance of the infrastructure supporting the media, and the overall climate for freedom of information. European countries dominate the list of the 50 best performers on media freedom in the 2014 index, with 14 EU nations ranked among the top 25. "The models of respect for media freedom are in Northern Europe. Finland, Norway and Netherlands have led the index for years," the watchdog noted. "Their success rests on solid constitutional and legal foundations, which in turn are based on a real culture of individual freedoms, a culture that is more integrated than in Southern Europe." The only positive evolution in that part of the Old Continent was found in Italy, RWB added. The country "has finally emerged from a negative spiral and is preparing an encouraging law that would decriminalise defamation via the media." Italy was thus able to move up eight positions to the 49th. But Rome-based "Ossigeno per l'Informazione," an observatory monitoring threatened journalists in Italy, disagreed with RWB's assessment, saying that it was "based on a factual error" and was counterproductive. The organisation issued a statement, asking the media watchdog to correct its positive opinion. "I hope that Reporters Without Borders will rectify the judgment on Italy, which sees for 2013 an improvement in freedom of the press that is wrongly motivated by erroneous data published on the reform of defamation under discussion," Ossigeno Editor-in-chief Alberto Spampinato said in the statement. "The proposed law on defamation presented to Parliament in 2013 does not provide for the decriminalisation of the offense announced in Paris by RWB and long called for by the whole of Europe. According to the opinion of the various European institutions, the new law proposes the replacement of imprisonment with disproportionate economic sanctions that are no less intimidating". "Pretending to improve the legislation in a substantial way when this is not true harms all those who are fighting against inaction and attempt to draw attention on these forgotten problems. The severity of the Italian case is demonstrated by objective data collected by Ossigeno, and which cannot be minimized". A slightly better mark than the one it was given last year allowed Slovenia to move up one place to the 34th, while Serbia jumped nine slots to rank 54th in the world this year. Turkey, which was shaken by violent street protests last year and where scores of journalists have been sent to jail or face prosecution in retaliation for their work, retained its 154th position in RWB's latest survey. "Despite its regional aspirations, Turkey registered no improvement and continues to be one of the world's biggest prisons for journalists. The Gezi Park revolt highlighted the repressive methods used by the security forces, the increase in self-censorship and the dangers of the prime minister's populist discourse," RWB said. Turkey's neighbours – Greece and Bulgaria – are the two SEE countries that have lost most ground in the WPFI year-on-year. Greece fell 15 places to the 99th, while Bulgaria plunged 13 slots to take the 100th place in the global table, retaining its standing as the lowest ranked EU nation. In 2013, Bulgaria was shaken by months of anti-government protests. Nationwide rallies against austerity and corruption turned violent in February, prompting the resignation of the country's centre-right government to avoid further violence. A second wave of mass protests erupted in mid-June following the election of a 32-year-old media mogul as head of the State Agency for National Security. Although parliament eventually revoked its decision and cancelled the appointment several days later, the protests continued for months on end. "Reporters were repeatedly the victims of police violence during these demonstrations," RWB noted, adding that, "Independent journalists, especially investigative reporters, are meanwhile exposed to harassment that can take the form of arson attacks on their cars." In September, the car of Genka Shikerova, a co-anchor at Sofia-based nationwide private bTV channel, was set ablaze outside her home, in the wake of several hard-hitting interviews with senior politicians. Greece, which was ranked 35th in the world in RWB's WPFI in 2009, has fallen more than 50 positions since. After years of mass anti-austerity protests, layoffs in media organisations, economic difficulties and grown unemployment among journalists, the security situation in the country has been aggravated by the rise of the neo-Nazi party Golden Dawn, according to RWB. "Physical attacks have become systematic throughout the country. Death threats are growing. June 2013 was a turning point in Greece's media history," the body noted. In a bid to cut spending and under pressure from the country's international lenders, in June, the Greek government closed the state-owned national broadcaster, ERT, consisting of four TV and five radio stations. Within hours, "dark screens with the words "No signal" stunned Europe and the world," RWB said. "Under international pressure, the government finally announced the creation of a new state broadcaster to be called NERIT." Ranked 34th in RWB's 2009 WPFI, Macedonia has been falling steadily in the media watchdog's rankings since. After dropping a further seven slots, it now takes the 123rd place in the global table. The country has been hoping to be given a starting date for entry talks with the EU ever since it gained recognition as an official candidate country back in December 2005. Although Skopje has undertaken reforms to meet the bloc's membership requirements, "the democratic window-dressing of the past few years is not enough to hide the many freedom of information violations," RWB said. A controversial case widely condemned by various organisations was that of Tomislav Kezarovski, who was arrested in May over an article he wrote back in 2008 for the Reporter 92 magazine, in which he revealed the identity of an alleged protected witness in a murder case. The journalist was sentenced to four and a half years in prison in October, with his jail term eventually changed to house arrest under international pressure. "But another Macedonian journalism, Zoran Bozinovski, was arrested in Serbia on an Interpol warrant for spying the next day," RWB noted. "Known as "Macedonia's Julian Assange," Bozinovski has done a great deal of investigative reporting on Sashe Mijalko, Macedonia's intelligence chief and relative of Prime Minister Nikola Gruevski." Romania dropped three places to the 45th in the 2014 WPFI. The country's lawmakers voted last year to recriminalise insult and libel as part of a wider amendment of the Penal Code. The move drew criticism from national and international organisations, which urged President Trajan Basescu to reject the legislation. Croatia, Cyprus and Montenegro, dropped one place each, to rank 65th, 25th and 114th, respectively, in this year's index. Croatia joined the EU as its 28th member on July 1st 2013, after six years of accession talks with Brussels. Although the process led to significant changes in the area of media freedom in the country, "much remains to be done," according to RWB. "The state radio and TV broadcaster HRT has been criticized for a lack of independence after reforms carried out under centre-left Prime Minister Zoran Milanovic. The head of HRT, the members of its supervisory board and its administrators are now appointed by parliament. This gives the ruling party political control over broadcast content," it said. Two potentially deadly attacks against journalists took place in Montenegro in 2013. Voicing concern about the safety of journalists in the Adriatic republic, RWB cited the one targeting Tufik Softic, an investigative reporter, writing for Montenegrin daily Vijesti and the Monitor magazine, who is "used to threats and violence". The incident occurred in August, when "a TNT charge exploded outside" the reporter's home in the town of Berane. At the time of the explosion, Softic was at home with his family, but no one was hurt. However, "the bomb could have been fatal if it had gone off a few minutes earlier," according to RWB. In late December, a bomb exploded under the windows of Vijesti editor-in-chief Mihailo Jovovic's office at a time when the editor and more than 15 of the paper's staff members were inside the building. The explosion caused material damage, but no injuries. In Montenegro, which began membership talks with the EU in June 2012, independent journalists face also verbal attacks. Prime Minister Milo Djukanovic's "Democratic Socialist Party (DPS) that has ruled Montenegro for nearly 20 years, wages full-blown hate campaigns against independent journalists," said RWB. "Often branded as "traitors to the nation" or "fascists," they are also subjected to threats and insults of incredible vulgarity. In 2013, shortly after publishing an op-ed piece headlined "Dancing with the dictator," Monitor editor Milka Tadic-Mijovic was the target of obscene sexist vilification by various means including an SMS message. Although a report was filed with the police, which was given the phone number from which the SMS was sent, no action was taken against those responsible." A day after the release of RWB's 2014 WPFI, a car belonging to daily Vijesti was set on fire in Podgorica.